Eucalyptus monoculture dominates the landscape in Espírito Santo. This is not an innocent tree planting project; in fact, some regional estimations report up to 80% of the lands are enclosed by eucalyptus and sugar cane monocultures. This is the case in the municipalities of Conceição da Barra and São Mateus located in the far northeast of the state. Eucalyptus plantations were installed during the military dictatorship and began operating in territories including traditional lands of the Tupinikim and Guarani Indigenous Peoples as well as in Quilombola regions. Communities have struggled for decades to survive the continued land evictions, waterway contamination, pesticide* poisonings, depletion of their livelihoods and biodiversity, destruction of the Atlantic Forest, exploited labor under appalling conditions, and continued threats from the eucalyptus industry. Eucalyptus is a fast growing tree that has a six year rotation cycle in tropical climates at low altitude. Brazil is the first country to allow research on genetically modified eucalyptus trees that would produce more pulp, grow faster, and at higher altitudes. The eucalyptus is pulped in one of the largest paper pulp factories in the world installed by Aracruz Celluose, now Fibria. Plantar SA is subcontracted in the region to manage the majority of the work in the fields. 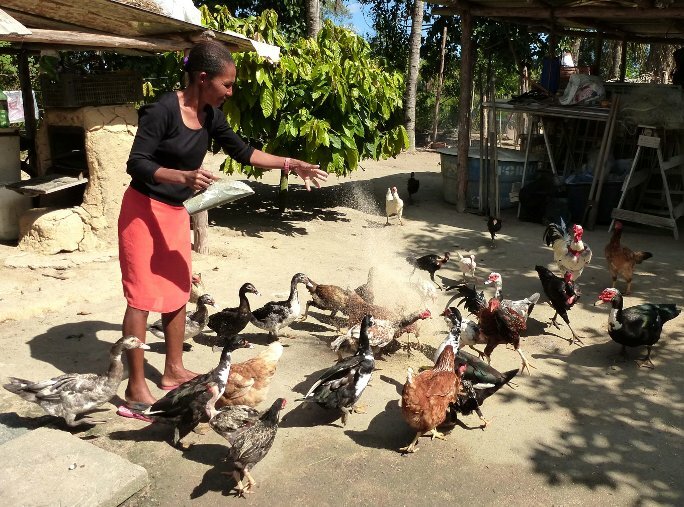 In 2008, Plantar SA** began a women’s worker program to supposedly “empower women” from Quilombola communities by employing them as “guardians” of the plantations. The work came with long hours, direct contact with dangerous pesticides and little to no support from the company. Exploitative work programs such as these often serve to create internal conflicts between and within communities and damage local organizing efforts. Quilombola communities are a recognized cultural group of African descendents made slaves by Portuguese colonizer. They organized many revolts and set up their own communities. 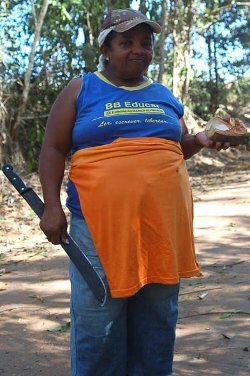 Quilombola people have legal rights to their lands in Brazil but are severely discriminated against. The exploiting companies in the region take advantage of these inequalities. Plantar SA not only has profited by destroying livelihoods, it has destroyed the social and local environment. Some areas of the plantations are considered “carbon offsetting” projects under the slogan of “reducing greenhouse gases”. This allows the company to generate carbon credits and sell them onto polluters in carbon markets. By sustaining an environmentally destructive model of monocultures and steel production, offset projects do nothing to improve the climate. *The term Pesticide is defined as a chemical agent used to destroy any pest. This includes all classes of agrotoxic chemicals including: herbicides, insecticides and fungicides, to name a few. 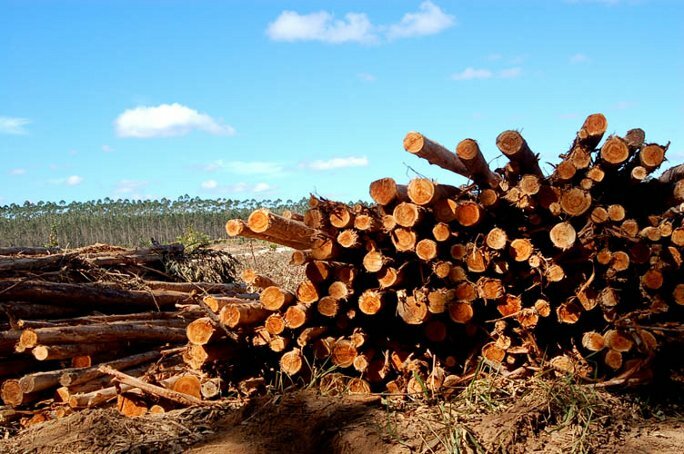 ** Plantar SA is a plantation and steel company responsible for the destructive and expansive monocultures in Minas Gerais and also operates outsourced field labor in ES for Fibria, formerly Aracruz Cellulose. Sineide worked for Plantar SA spraying pesticides for more than two and a half years until her health was destroyed and she was forced by the company to leave without compensation. She was in regular contact with a toxic insecticide called Mirex-S, which has been shown to produce cancer, harmful effects on stomach and intestinal linings, damage to the nervous system and the reproductive system, among others. On several occasions Sineide passed out while working in the fields and would receive only a few minutes rest before being forced to return to work. She now suffers from reoccurring health problems. Sineide is nevertheless an industrious woman who raises several species of fowl, pigs, and vegetables. She is generous of heart, completely direct in her way of speaking and a great cook! “I worked for two years and eight months for Plantar. When they hired us they told us we would work in the nursery, but after the training they told me the job was to spray Mirex on the ants in the fields. Except for when it rained, then we weeded and marked the plants. They gave us little food and it was bad. The water was muddy, hot and tasted like chlorine. One day I complained of lack of water and the manager told me: “I do not care if you’re thirsty, you have to finish the entire field before we leave at 6pm.” Because I complained, he took away hours on my timecard. If you miss one day, they dock you for two. We caught the bus at 4:30 am but there was never a fixed hour that we would return. In general we returned around 6pm. They only gave us two changes of clothes so I had to wear the same clothes contaminated one day after the other. I would come home in the same clothes and wash them at the weekend. I had to carry heavy boxes on my head that started to give me back pain. One woman fell into a hole with the pesticide pump on her back and they said it was her lack of attention. But the whole ground is lined with eucalyptus leaves and twigs. Today her leg is worse. 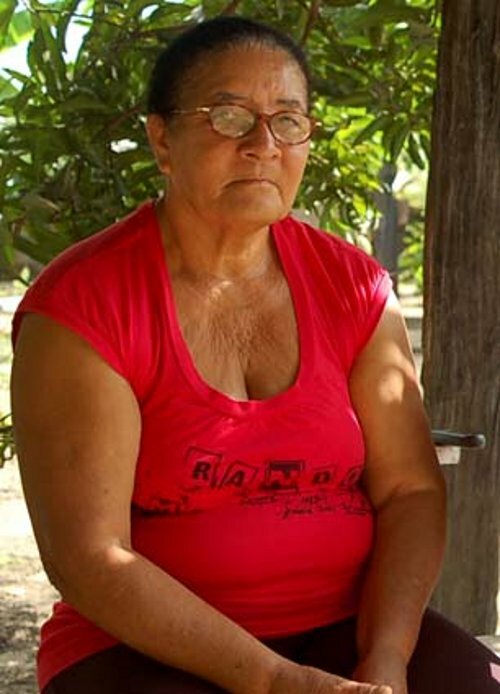 She and was waiting for the INSS [Inscrição no Instituto Nacional do Seguro Social; Social Security Administration] at home without pay for two or three months. She was not just sent away because it was an accident at work. “After a year working for Plantar I started to feel pain daily and I wore a mask. When I went to bed at night my heart pounded and I have never had heart trouble. I also had dryness in the throat and difficulty breathing. I felt colicky with abdominal pain and I would pass three or four days without defecating and when I did it looked like a glue. My menstrual flow increased so much that I had to wear disposable menstrual pads and change them every hour, and it wouldn’t hold the flow, it was like a river. Later I started having a crisis with strong convulsions where I would fall onto the ground and talk all balled up about two times per month. They took me to the doctor and he said it was just nerves. He gave me medicine, I fell asleep and then he sent me home. He just gave me a painkiller. I had to buy so many medicines with my own money for weakness in the bones, spine and blood. The medication made me vomit. To this day I have no more appetite, it seems that my stomach is closed, is smaller, and I feel a pain in my abdomen all the time. I feel drowsiness, despondency and depression. I thought for a long time that it was not all because of the chemicals [Mirex] but when I realized it was, I left the job. If I would have continued on, I would not be alive anymore. Every day I was weaker. I left this job. I lost my health at this job. This work at Plantar is captivity. People have already suffered too much working for them. 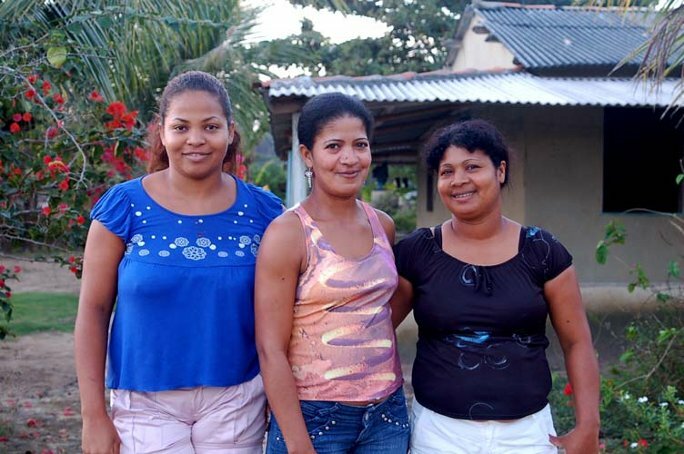 Ivonnete Mota Alves, Luzinete C. Carvalero and Ana Aparecida Caldeir a Carvalho worked for Plantar SA during the phase of “women empowerment” over a span of about 18 months. They left for the bus around 5am and returned at night around 8pm five days per week. One day after work the women were told by the company that their contracts were terminated. They were given no explanation, no compensation and told not to return. 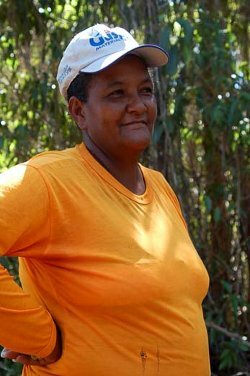 “They hired us women to spray the ants, but after two months we started to do everything: hoeing and cutting. In the rainy season we would cut the undergrowth and when there was sun we tilled to prepare the space to plant eucalyptus. I worked with Mirex. I wore gloves and a mask. The back sprayers always got stuck or the hoses didn’t work and we complained but they were slow to fix them. PPEs (personal protective equipment) were supposed to be changed every six months and when we asked to change we had to spend more months with the same mask. “I worked for Plantar for two years. They offered us a course to work in ant control. I do not know why they fired us. We are now unemployed. We tried to plant a vegetable garden because we have nothing to eat but the plants will not grow due to lack of water because we are surrounded by eucalyptus and acacia. They promised to give our jobs back after one year but they have not. We wake up and stand idly without having work. They were cruel to us, they pushed us to work fast. And with those masks, we had to take breaks because we were dizzy especially when the sun was hot. One time I became dizzy when I was using the hose from the tractor to water the eucalyptus saplings. It was very heavy and I fell but the tractor kept pulling me. I felt back pain and had headaches. It was a dangerous job. The courses explained that Mirex could give you cancer that had no cure and would cause blisters on your skin. We felt scared, but it was hopeless because we had no other work. We arrived at work hungry. The chicken scraps they gave us did not solve our problem. We made only about RS$200.00 ($80 USD) per month. One can not live on only that. Some days I wake up and want to cry wondering what to do with the children, who will feed them? We have no work, no fish in the stream, we do not have any more land to work. 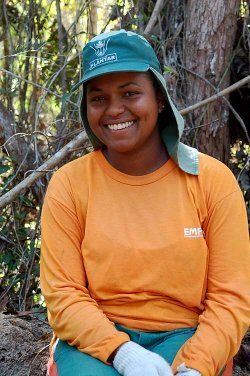 Gilsa, Gessi, Nilcéia and Creuza are from the Association of small farmers and loggers of Conceição da Barra, Espírito Santo (APALCB). They are Quilombola women from the community, Roda D´Água. After a harvest of eucalyptus trees has taken place, they work to collect the left over branches that are sold on to make charcoal. 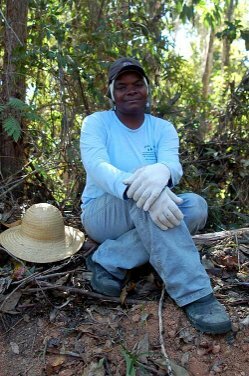 “We work as gleaners with the APALCB (Association of small farmers and loggers of Conceição da Barra). First Aracruz1 gave five hectares to each member to pick up branches and at this time they still left plenty of wood behind. But for a while now, they take most of the wood and we are suffering. This is heavy duty work for us women, but we do not have what most have to survive so we have to deal with it rain or shine. We arrive here between 7 and 8am and we spend the whole day here. We get home at almost 8pm, tired. My arms hurt too much to continue using a machete to cut branches. This is very painful for women. It makes me sad to see our houses, yards and animals not being cared for because we don’t have time. Our cultural knowledges are being forgotten. Women are too busy and tired because of this work. It is difficult today for a woman to care for her garden. Eucalyptus is suffering. We have no time to take care of our culture. This is no life for us women. It hurts me a lot. It is slave labor. We are living in captivity. They are only missing electric shock torture. We’re not in this struggle because we want to be. If there was something else for us to do, we would surely do it. The company takes advantage of the fact that the communities do not have another option. We only live in conflict with the company. Our desire is to never return to work, but how can we survive without money anymore? We have a piece of land, but no money to invest in it. The company does not want to help anyone, it just wants to fill up its pockets with money. It keeps inventing projects because it needs to show that the local communities are involved. A few pictures of workers doing anything, and they use them to show community involvement. From the point of view of the company, they would prefer that the Quilombolas and indigenous communities no longer existed. After the arrival of eucalyptus our culture was over. Before we lived by planting and harvesting. We made sausage, we planted mandioca, we made flour that we sold and comsumed. We had animals like pigs, chicken and cattle. We fed our children in the morning potato, aipin and manioc also string beans, pigeon peas, and broad beans. We raised the pork ourselves and we had chickens and eggs and also fish in the streams. We had coffee and we used palm oil and lard. We also had parties inside and outside. I wish we could raise our children and grandchildren how we were raised in this abundance. In the garden of my father papaya and banana would spoil… because everyone had these trees. We had so much in the native forest. With the arrival of eucalyptus it was all over – devastated everything. We have many memories. My mother cried when she saw the native trees being dragged away by tractors. Our lands were a place of survival. Also we had good water, but there is no more water in any stream. How will we live without water? My 18 year old boy wondered how we grew rice, because he never saw it but I used to plant so much. I hope we can find a way out of this situation, for the better. We want our lands back, we want to replant the forest on the edge of the streams, we want full removal of eucalyptus and the government to invest in us. Aracruz ended everything for us, but now the government has the opportunity to change this. The company destroyed the native forests, and it should have to replant it. Our wealth was put into the hands of the company. The only way to change this situation is for the company to leave. Jorge worked for Plantar SA in the early 2000s under deplorable conditions. He lost his health and livelihood and has fought for years in the courts for compensation. In addition to the insecticide Mirex-S he was in direct contact with several highly toxic chemicals including Monsanto’s Roundup herbicide, which has been linked to a litany of health disorders and diseases including Parkinsons, cancer and autism. He still awaits justice. “I worked for Plantar and then I got sick, the manager signed the papers and dismissed me. I worked one year and two months with poisons, Mirex, Scout, Roundup and a product called Amarelão to combat eucalyptus rust leaf. I fainted two times in the field and after that they brought me to work in the nursery, but it was when the manager wanted me to sign the papers that I asked him to wait for my health to improve. Since I was fired in 2002 I have not regained my health, I am always sick and can no longer work. I went to court with a lawyer, but still it has not been resolved. The chemicals got into my boot and I lost all of my toe nails. On rainy days, the boot foamed and looked like it had soap in it. I still have a lot of pain in my feet. Where the poison contacted the pant leg it burned everything, even the boot leather. “My husband took all of these medicines to see if something could help to fight these problems he was having. It is a difficult situation because he can no longer work. He lost his strength, his heart, vision and everything. Today he is a man who is totally frail. He has been so strong to deal with the numbness, pain, swelling, the weakness in the joints and nerves. The justice process has been going on for 10 years and still nothing has been resolved. The lawyer initially said that we would win. There was a review of RS $10,000 (aprox. 4,000 euros) on the day of the hearing from RS $200,000 (aprox. 77,000 euros), and down to RS $150,000 and the judge said it was solved, but so far we have not seen a single penny. The process has been abandoned in the labor courts. 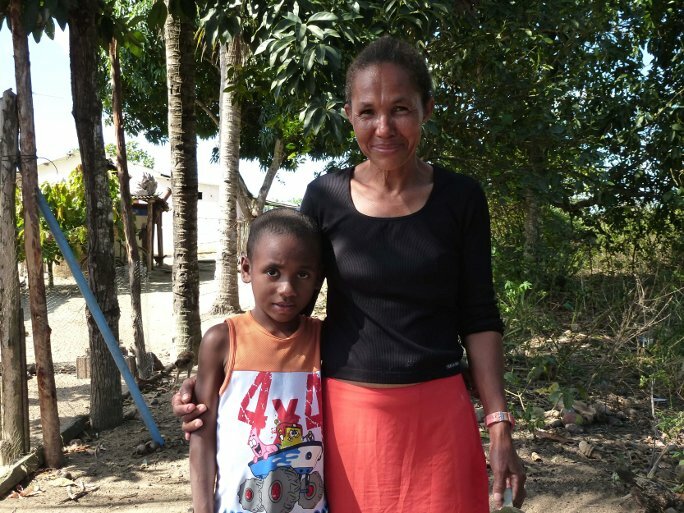 João is also a representative in the Comissão Quilombola do Sapê do Norte (The local Quilombola governing body) and worked for FASE-ES, an organization focused on supporting local struggles and popular education. He is from the community of Angelim 1 and has been active in the struggles to reclaim Quilombola lands stolen by the companies. 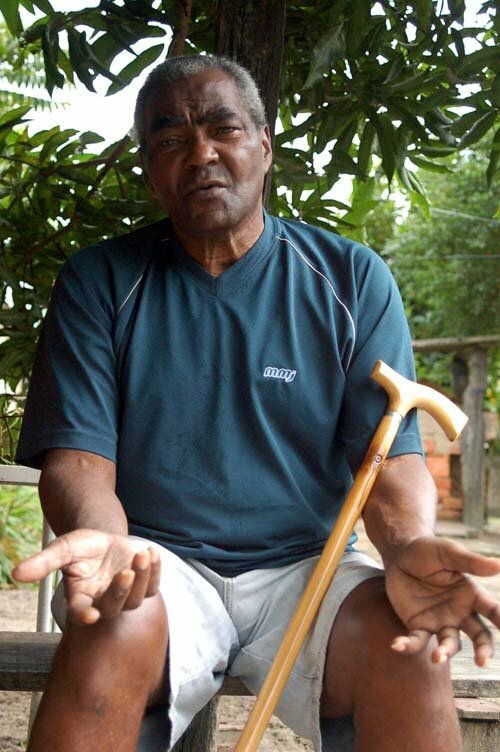 João taught agronomy for the Movimento dos Trabalhadores Sem Terra (Movement of Landless Workers– MST) for several years. He has successfully used traditional Quilombola knowledge to turn the pesticide contaminated soils back into fertile agroecological lands. “Since the late nineteenth century we have lived in this territory. Before, these were rich lands, but I can no longer see this richness. When eucalyptus arrived so much changed. It was during the dictatorship. They began to evict Quilombolas, rip out the forests and kill many animals. Humans were intimidated into leaving. Few resisted. After 50 years of the arrival of Aracruz in the region, we have no clean water for drinking, washing or bathing. At the river head they dump tons of chemicals. We continue without lands and practically no water. There are so many people in need of land to live. We have lost many young people in the community who moved to big cities like São Paulo, Belo Horizonte and Vitória and there are many others who want to go. In August 2010 we began a land dispute struggle with Aracruz which historically was where we grew our crops. It is an important area for the community because it unites two core villages that had already been one year without planting. We have partnered with other movements in the countryside and the city. We are designing new agriculture back into that area. It was a historical fact that the land had not been used for crops for 40 years since the clearing of the forests. We will never stop fighting to take back the area definitively. We have seen progress in the process of land regularization by the State. There is a strong group in the community – who believe in recovery of the forests and in the land recovery – that no longer want to be subordinated by this company or fear to speak the truth. My grandparents left me an important legacy of love and respect for the land and to work for strengthening agriculture. Those who do not want to, I have patience. Those who are leaving one day can return. And those who are staying can build progress and processes on the land, because urban centers are already full and we believe in quality of life in this region. We want to intimidate the company by showing its impacts, which has destroyed, has ruined, and has generated poverty. Anything that the company gives us could never be a compensation, because it is rights that are being demanded by the communities.